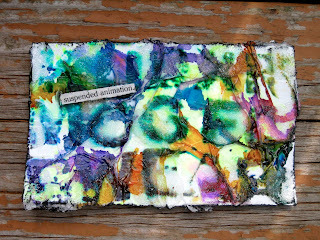 honest heART studio: another set of ICAD cards to share! I haven't taken photos of the envelope journal that I shared on my YouTube channel yesterday and I really ened to get that done for you all! Sorry about that, I was going to do it last night and then my husband and I had to watch the next episode of Warehouse 13. lol Don't you just love Netflix??? I did get another set of cards done yesterday and a video is up on how I created them. So be sure to check that out too here. I'm feeling pretty achy today and battling my allergies and just not up to adding all of the subtitles for the products that I used on these cards, so if you have any questions, please ask and I'll let you know. I think I already commented on ICAD- but I Just Love these! I Love your style- can't wait for more!